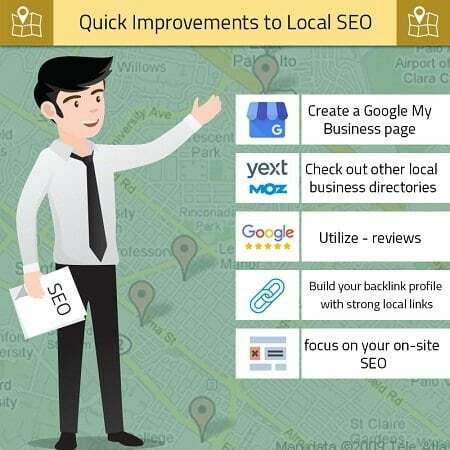 If you have a website that is geared towards a regional audience, then local search engine optimization (SEO) is tremendously important to get the full range of benefits from organic traffic. The key when it comes to local SEO is to focus your efforts on the right things. It does not even have to take that long to make significant changes which can have a notable and lasting impact on your website and business. There are certain things that you should be taking advantage of no matter what. The first step is to create a Google My Business page if you have not done so already. This is a direct way to provide Google with information about your website while also improving the content of your listing so that you can get better click-thru rates from searchers who see it. It does not take more than fifteen minutes to do, but you should make sure that your hours of business, phone number, and directions are listed correctly. Also, add high-quality images of your business as this can improve click-thru tremendously. A good description can also help in this regard and help you support your brand. The final thing you want to make sure of is to verify the page with Google- they will send you snail mail with a pin to do so, so make sure to check the mail after requesting verification. Once you are set up on Google My Business, check out other local business directories. A good place to start is with an automated submission service to hit a large number to start. There are many services offered by firms like Moz, Local, Aabaco, and Yext, which can get your website submitted to hundreds of directories relatively quickly. It costs about $90 per quarter to do this but can have tremendously marketing upside. Submitting to these services will lead to your sites appearing on well-trafficked directories including MapQuest, FourSquare, and Yahoo Local. Beyond these services, there may be smaller, regionally focused directories like business commerce groups in your area where you can get your site listed. These are also quality backlinks if you are able to find them. Once you are in directories, it is time to utilize their key community feature- reviews. You want to encourage happy customers or users to leave reviews on sites like Yelp, Google, and others. Not only will reviews help you with ranking better in search results, but the reviews themselves (if favorable) can have a positive impact on conversions. Getting quality reviews is always better than just going for a high number, but preferably you want a combination of both that really offers new insights for potential searchers. A good way to generate reviews at the start is to identify key loyal customers and reach out to them in a personalized way for reviews. You will find that consistently happy customers will be glad to help you out and spread the word about the business. The next thing that you should try to do is build your backlink profile with strong local links. Be sure not to do anything spammy, as this will get you nowhere and might even hurt you with Google. Getting on local business pages, potentially local news websites, etc. can be a big boon though if done correctly. It can even help you generate buzz, especially for newer businesses where the locals may not even know about you yet. Finally, you want to focus on your on-site SEO. Include your business name, and key information like your contact information (including a local phone number), address, and hours on your website. Reference the local market in your title tags and H1 in a natural way. Make sure that your contact page has directions to your site- perhaps even embed a Google maps app that shows where it is. Keep it natural, but make sure that your website embodies that it is local. Doing these five things can help you drastically improve your return from local SEO and local searchers. It only takes minutes to do each of these things, but the downstream impact can be quite large. Local SEO is worth the time and provides a good return in almost all cases, so don’t discount it.